The mission of the outreach component of the Portneuf Watershed Partnership (PWP) is to provide a framework to increase community watershed awareness, education, and action and to facilitate the support of decisions, policies, activities, and other practices that seek to restore and protect water quality in the greater Portneuf Watershed. Create a working coalition for the outreach and education of the Portneuf Watershed. Increase involvement of residents, businesses, and other stakeholders in watershed protection activities. Increase community outreach of watershed education, restoration, monitoring and protection activities. Identify community awareness levels regarding the Portneuf Watershed. Create an effective communication network for groups, agencies, and other entities working on Portneuf Watershed issues. Identify existing and potential support, funding and other external resources to assist in building sustainability of PWP. 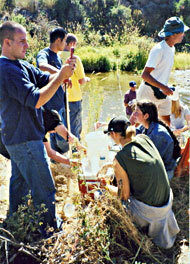 Idaho State University students conducting ecology sampling on the Portneuf River.